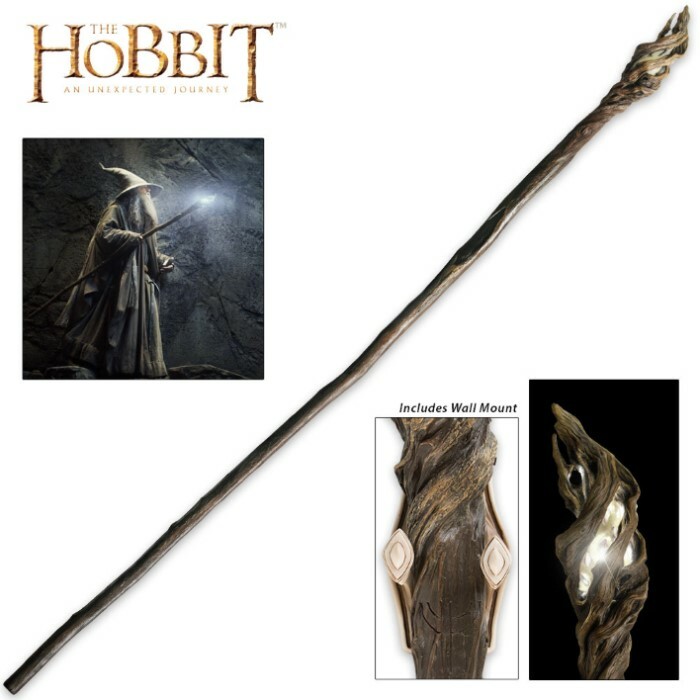 The Hobbit Illuminated Staff of The Wizard Gandalf the Grey With Wall Mount - High Intensity LED Light - 73" Length | BUDK.com - Knives & Swords At The Lowest Prices! This special edition of the Staff of the Wizard Gandalf features an illuminated crown that glows just like the one wielded by Sir Ian McKellen in the motion picture The Hobbit: The Desolation of Smaug™. 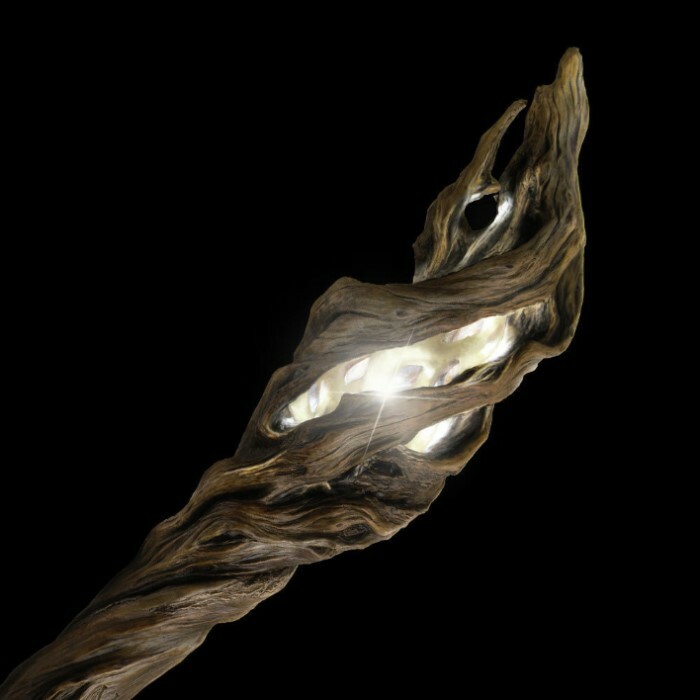 Cradled by the crown’s spindly, twisting faux-wood skeleton, a high intensity LED gleams brilliantly from behind a striking translucent lattice. Broken by the asymmetrical framework of the lattice, the vivid white light scatters into beaming, multidirectional rays - glinting and sparkling as the staff is turned. The light reciprocates by bathing the crystalline lattice in a warm golden glow. Activated by a hidden button, the 100-lumen LED boasts a 50,000-hour lifespan and shines for an impressive 20 hours on just a pair of AA batteries (not included). Awesome Replica-Just like Gandalf's in the movie--the led light is very bright & just gives the staff an even more movie-like quality!!! Thanks again BUDK for providing fans with the best replicas that money can buy!!! This thing is incredibly nice. The size is right, the shape and detail are very well done. The weight is hefty, feels like a very solid construction. The light feature is well made with a nice quality switch and battery compartment. Even the wall hanging unit is beautiful, Its polystone over a metal frame and painted very nice. I dont write reviews very often but this thing is an extremely nice addition to my collection. I bought this as a gift for my husband, he loved it and was amazed by the amount of detail on the staff. It was money well spent and the service was fast and simple; we will definitely be buying more LOTR/ Hobbit replicas from this site.